I’m always looking for fun and engaging activities for my students. The new Boardmaker Studio software is great because the new actions you can add to buttons really engage my students. I work with students who have fleeting attention and it can be really hard to find activities that will interest them and hold their attention. This activity was a home run so I wanted to share it! I made a seasonal activity that focused on fall vocabulary and got my students up and moving. 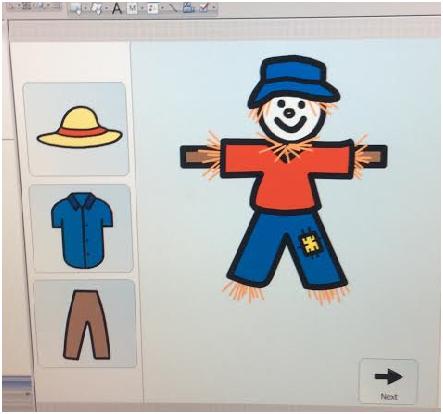 The first page of my project was a scarecrow with different clothing items that my students could drag onto the scarecrow. The buttons are movable so my students were able to drag them across the screen. This was a fun because it got them up to walk towards the screen and then drag buttons across the screen. The classroom I work in has an awesome device called the TAP-it which is a portable screen that syncs to any computer. 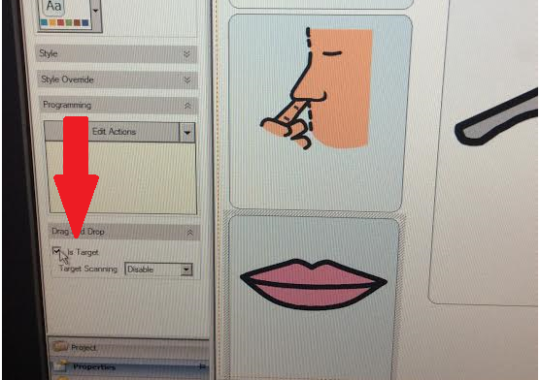 It allows my students with physical impairments to access a screen very close to them. It really makes these activities more engaging. The same effect could be achieved with a Smart Board or any sort of smart white board. The next page was a similar. It had a large pumpkin with body parts for my students to drag onto the pumpkin. 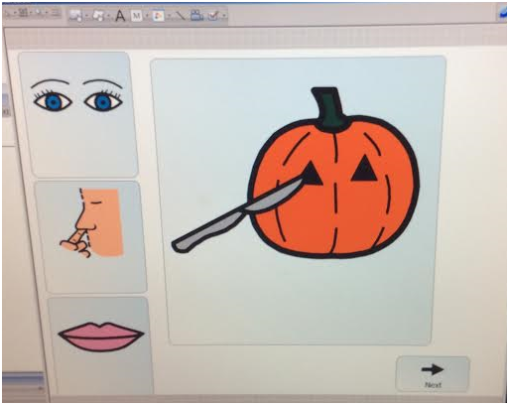 This was a great way to practice labeling body parts with the fun activity of making a jack-o’-lantern on the screen! Repeat for as many pictures as you want! I’m really proud of the last page of this project. 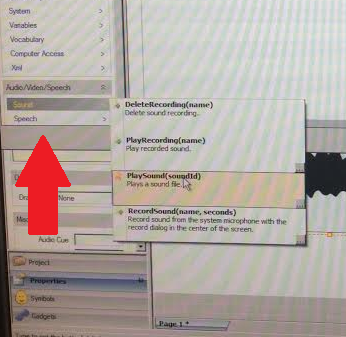 I used the feature of embedding sound files onto the Halloween buttons so that when you tap on the button, you hear a sound. This may seem technologically difficult but it was surprisingly easy! I used ghost, cat, and bat noises but you could come up with any Halloween image and sound pairing – witches and ghoulish laughter, and so many more! This activity can also be modified for any theme or holiday. 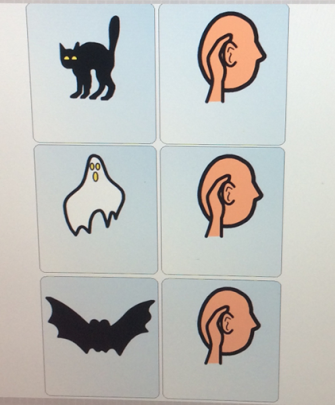 The fun part was watching my students come up to the screen, tap on the picture, and see how excited they were to hear the sounds. This is a really motivating activity for kids who love to hear different sounds. To find a sound file I searched on Google for “free Halloween sounds”. 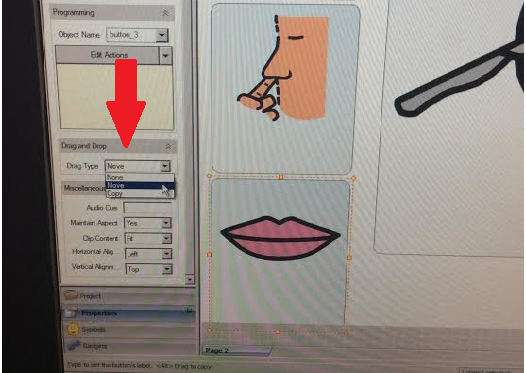 I found ones that I could download, saved them to my computer, and then was able to open them in Boardmaker to put into this project. Hope you can use this fun activity! Happy Halloween!! Sign up for our mailing list here to stay updated with our latest therapy tips, app announcements, and blog posts. Don’t forget to follow us on Twitter, Pinterest, and like us on Facebook!